Discussion in 'Downhill & Freeride' started by - seb, Aug 11, 2012. So, has anyone here had much time on one of these? Or heard any positive/negative things? I know they're pretty popular in Europe, but I've no idea if that's just because they're cheap, or if they're actually good as well? All the people that ride them seem to be happy. Quite popular in bike parks. Dirt thought the kinematics and the CCDB didn't work together well (they rode a prototype). A german bike mag did a test recently (http://www.freeride-magazine.com/te...iden-fuers-grobe-und-gefaehrliche/01/06/2012/) and if I remember right they liked the bike but thought it wasn't an all-out racing machine. More like a big bike for park riding. Thing is, it seems really light. It looks light, and they claim 3350g. That's undoubtedly for a small, with no shock, and probably exluding other bits like rear axle, but it's still nearly as light as a session/socom/v10c! So doesn't feel like it should be a "big bike for park" really. But at 64/65deg, a tad too steep for DH racing maybe. Especially as you have to put it in down to ~7" travel to get the slacker angle. Any idea what issue the dirt review was in? It has the right letters, any combination of the letters X R and F instantly make a bike pretty damn good. XR-F, FRX, RFX, FX-R, R-FX, etc. Especially as you have to put it in down to ~7" travel to get the slacker angle. That's not true. You have 4 settings: 185mm/65º, 185mm/64º, 203mm/65º and 203mm/64º. I have one but I can't give you much useful information, since this is my first big bike and my DH experience is limited. However, for the time being I'm happy with it (read the bike is miles ahead of the rider). I got it for the price factor, as anything from a known brand in Europe is way overpriced and in a complete bike you essentially get the frame for free. Dirt's comment is certainly related with the fact that the frame is not very progressive. However, I haven't noticed the bike using excess travel in the rear or bottoming out. But maybe it's because I'm not trying hard enough. See this link for the leverage curves and what not. How do you get 4 different settings out of it? Can that trackflip chip sit in any of 4 positions, not just the two that it looks like it's designed for? I think the geometry/travel will be fine, especially with the options that offset bushes and anglesets give us these days. 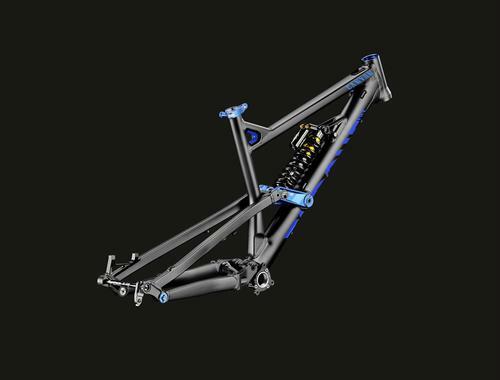 Frame seems to have a supershort chainstay, about the same as a Demo. That appeals, I like riding at the back of the bike, though I appreciate there may be a lack of front wheel grip in some scenarios, but I'm sure I can ride my way around that. 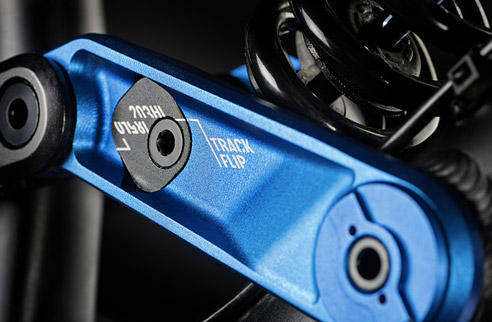 What's this all about too, is this a fitment for a steering damper?? If you swap the right and left trackflips, you get the extra 2 settings. In the one showing, you have the 203/65 and 185/64. The one that is not shown has the 203/64 and 185/65 settings. The thing in the second photo is a cover to a hole where you can pass a cable through the top tube. It is meant for adjustable seatposts, but I use it for the front derailleur cable. It was in Dirt 114. Only in the fresh produce section. If you can't track it down pm me your email. amrgb, interesting, thanks for that. Currently I have it on the 203/65 setting, and I measured the static head angle and it is 65º dead. Maybe it just sags more in the rear than other frames, making the dynamic head angle slacker than it is on paper. Seb have you tried hitting some german forums? Maybe with google translate you will find some reviews since last weekend in leogang I'm pretty sure I saw at least 30 of them. The frame should be good. I think the wb is a bit short but other than that a pretty versatile bike. But there are probably better frames out there for a racer. Anyone use this frame as a more all-mtn/DH bike. Like the soon to be defunct SX traill? It appears to have a more relaxed seat angle than the 73*/74* claimed... But if that seat angle genuinely works well for climbing, this could be an awesome climber's DH bike. I do. I use it as a non-lift assisted DH bike. I have mine setup with a Van 36 and a 22t ring up front, and it climbs rather well. Comparing with my previous Trek Remedy, it's a bit slower, but I can climb just about the same. The bike does bob a lot in de 36t ring, but in the 22t ring it's very neutral. A Hammerschmidt would be perfect for it. 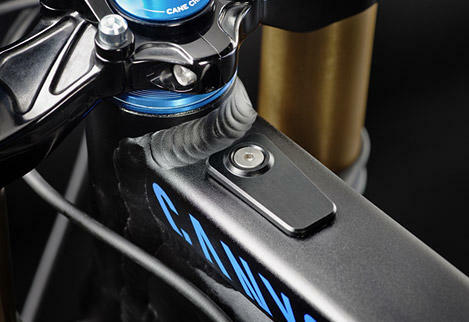 Regarding the seat post, the 73º angle is a virtual angle, since the seat tube has a bend. The seat tube after the bend is considerably slacker than that, but as long as you don't use a monster seatpost, the effective angle (from BB to saddle) will end up being close to 73º, which makes it rather acceptable for climbing. I can say that I never lost the front even in the steepest of climbs. He can also make custom adjustments to your frame if you would like. 2450 euro for a frame compared to a 3500 euro bike? For that price he could get an alu antidote with a bos/ccdb shock and If I heard the owner right the newer alu antis will come with carbon rears.